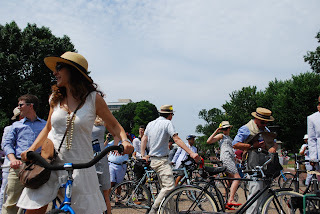 The Seersucker Social Ride, organized by group Dandies & Quaintrelles, was a great example of how bicycling can be a fun and fashionable communal experience, allowing people who would not ordinarily ride bikes do so with those who have extensive riding experience. According to the Dandies & Quaintrelles site, the District-based social group was established in 2009 and organizes and hosts vintage-inspired, stylish events to support noble causes. This is the second year for this spring event and will be followed in the fall by arguably the more popular Tweed ride, typically held in November. 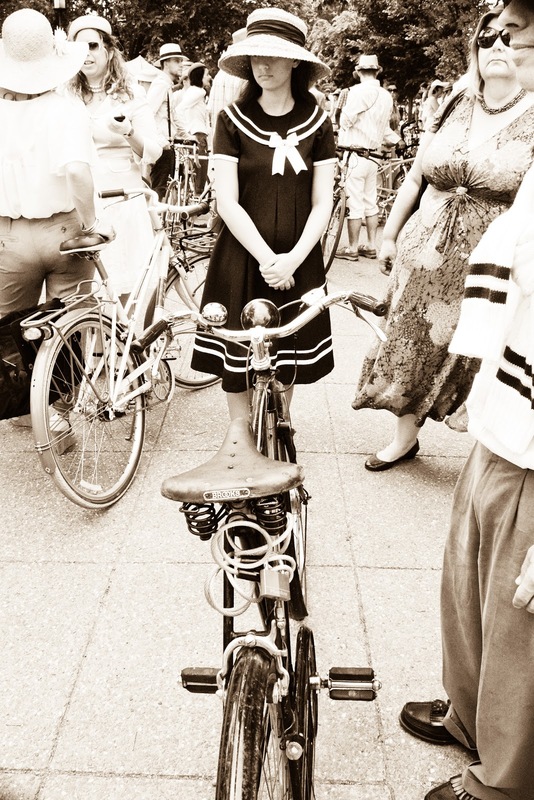 While the ride has happened in other areas of the world and while people riding bikes in vintage clothing is not new, the Seersucker Social ride has developed quite a following in the District. Last Spring's Seersucker ride drew about 300 cyclists. While total numbers are somewhat hard to determine because the riding portion was a free event and unregistered, it appeared that the number of bicyclists exceeded the initial 700 estimated by co-organizer Eric Channing. The event's flickr page provides a comprehensive look at the fashion and bicycles in attendance. The day started with a comfortable temperature somewhere just north of 80 degrees at Meridian Hill Park. Completed in 1936 and designated as a National Historic Landmark, the park was a picturesque location to begin the ride. The local bike shop BicycleSPACE was kind enough to provide minor tune up to arrivals as they waited for the ride to commence and dispensed liquid refreshments at one of the rides rest spots. The ride was divided into two routes. The shorter ride was less than seven miles (reported to be only 5 miles), venturing around the Columbia Heights, Petworth and through Rock Creek Park and the other totaled approximately 12 miles (reported to be only 10 miles) and traveled throughout Northwest Washington and included stops along Pennsylvania Avenue in front of the White House and Sherman Circle. The ride ended with a somewhat challenging hill, riding a quarter way up Tilden Street NW and then up another steep incline to the Hillwood Estate and Museum and Gardens. Once at the Estate, guests were treated to a period-themed band, crochet and other games of leisure, and drinks of varying strength in a garden that mirrored elements within the Palace of Versailles. The event allowed for the gathering of the distinct community bicycling of types. That community was evident as the longer 12-mile ride meandered along typically car filled U, 14th (twice) and Eye Streets. With hundreds of riders, the motorized traffic waited several minutes to allow participants safe passage with only a one or two less-than-accommodating drivers. Vintage bikes and clothing along with no-so-vintage bikes and clothing created an opportunity to bridge what some have called the "bicycling culture gap". That gap can be described as a separation between those who ride for recreation, those who ride for transportation and those who ride for sport. This division is not hostile but it does make uniting on various biking issues much more challenging. Typically, club riders, those who ride semi-professionally at great speeds and for long distances, are not interested in bike facilities in the city. Those who ride daily may not like the increased numbers of novice bicyclists on the streets. The event showed that bicycling need not be a Lycra and team jersey wearing, carbon fiber, high speed affair but one that as approachable to the average person. In addition, the event likely brought people who had not biked in years perhaps because they felt comfortable biking relatively slowly in large numbers. The ride marshals from Earthcycle Tours along with volunteers, also helped make traversing certain intersections easier. With ladies in dresses and fancy hats and men in ascots and wingtips, it showed that bicyclists in the region can come together. More than just transport the fashionably dressed, it showed the bicycling in the District can be both fun and safe. Part of the reason could be attributed to the work that the District government and many advocacy groups have done. As the District adds bike infrastructure like bike lanes and Capital Bikeshare (which had a substantial showing), the comfortable people become open to riding. The majority of onlookers, both pedestrians and motorists, appeared supportive and positive as the event moved along city streets. Having great bicycling-centered events and an expanding infrastructure go hand-in-hand with reaching out to the District's neighborhoods. Each contributes to the unique culture of the District and continues to cement its status as a progressive bicycling community.